For many years The Chatlos Foundation has supported Cumberland College now known as University of the Cumberlands. We shine our spotlight on this outstanding school so that each of you can learn of its great heritage and alumni. Located in beautiful Williamsburg, KY, University of the Cumberlands is an institution of regional distinction, which currently offers four undergraduate degrees; more than 40 major fields of study; ten pre-professional programs; ten graduate degrees distributed over eight areas, including two doctorates and seven master’s degrees; certifications in education; and online programs. Now with an enrollment of 4,300 students the University of the Cumberlands has come a long way since its humble beginning as Williamsburg Institute on January 7, 1889. (The official date celebrated as the founding.) In 1913 with the acquisition of Highland College, Williamsburg Institute’s name was changed to Cumberland College. Blessed with an outstanding faculty where more than 70% have earned the highest degree available in their field and 60% have been teaching for more than 10 years. Honorary Degree Awarded to Mr. William J. Chatlos, Jr.
During UC Cumberlands commencement ceremonies on Saturday, May 10, 2014, University President Dr. Jim Taylor presented Mr. William J. 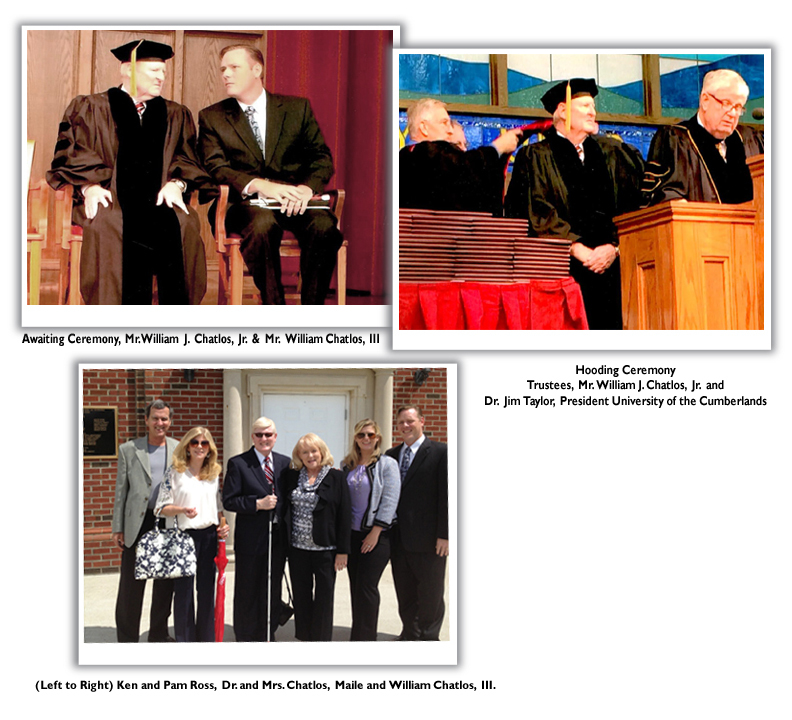 “Bill” Chatlos, Jr. with the Honorary Doctor of Laws Degree. Mr. Chatlos Jr., current President of The Chatlos Foundation, Inc. was accompanied to Williamsburg by his wife of 43 years, Janet A. Chatlos, his son William J. Chatlos, III and his wife Maile. Mr. William J. Chatlos, Jr., considers it a great honor to have received this degree from such an outstanding university. Under the guidance of William J. Chatlos, Jr., for the last 31 years, The Chatlos Foundation, Inc. which celebrated its 60th anniversary last year, has awarded grants in excess of $112,444,398 to 9,311 organizations worldwide. In addition to his philanthropy and business interests, Mr. Chatlos, Jr. has served in various leadership roles including the Foundation Fighting Blindness, The Society for Urology and Engineering, Florida Hospital Board, and the Lions Club International Foundation. In 2007, The Association of Fund Raising Professionals presented Mr. Chatlos and the Chatlos Board of Trustees with the Outstanding Philanthropic Foundation award. Used with permission of The University of the Cumberlands.